Hey embedded lovers from today I started to post series of 8051 tutorials and first post is use port as output using led interfacing with keil, BASCOM,Proteus. Hearer we are use P89V51RD2 which is made by Philips using 8051 core which belongs to the family of 8051 series of microcontrollers, is very commonly used by a large community of hobbyist and engineers. Its simplicity and ease of programming with inbuilt features easily makes its position in the top preferred list of microcontroller for both beginners and advanced user. LEDs are by far the most widely used means of taking output. They find huge Application as indicators during experimentations to check the validity of results at different stages. They are very cheap and easily available in a variety of shape, size and colours. The principle of operation of LEDs is simple. The commonly available LEDs have a drop voltage of 1.7 V and need 10 mA to glow at full intensity. 470 ohm is commonly used substitute in case 330 ohm, because 330 ohm is not available. P89V51RD2 is a 40 pin microcontroller which belongs to 8051 series of microcontroller. It has four ports each of 8 bits P0, P1, P2 and P3.The P89V51RD2 has 64K+8K FLASH bytes of programmable flash. The port P0 covers the pin 39 to pin 32, the port P1 covers the pin 1 to pin 8, the port P2 covers the pin 21 to pin 28 and the port P3 covers the pin 10 to pin 17. Pin 9 is the reset pin. The reset is active high. Whenever the controller is given supply, the reset pin must be given a high signal to reset the controller and bring the program counter to the starting address 0x0000. The controller can be reset by manually connecting a switch or by connecting a combination of resistor and capacitor as shown in the circuit diagram. A 11.0592 MHz crystal is connected between pin 18 pin 19. Pin 40 is Vcc and pin 20 is ground. 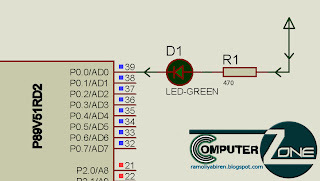 Pin 40 is connected to Vcc. LEDs are connected to the port P0. LEDs need approximately 10mA current to flow through them in order to glow at maximum intensity. However the output of the controller is not sufficient enough to drive the LEDs, so if the positive leg of the LED is connected to the pin and the negative to ground as shown in the figure, the LED will not glow at full illumination. 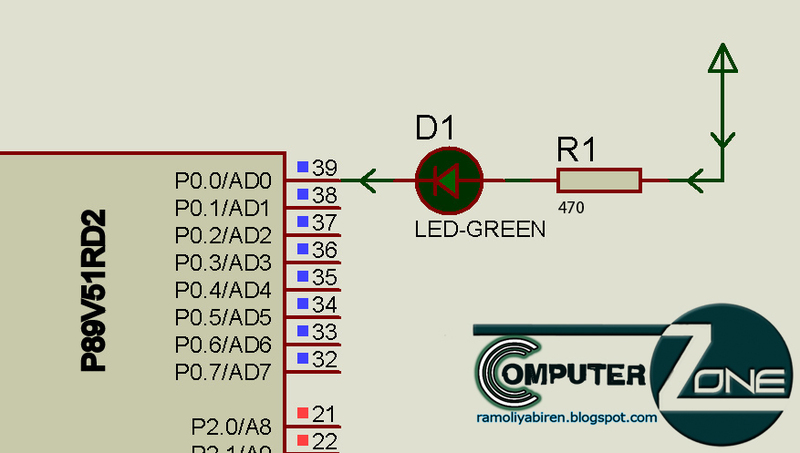 To overcome this problem LEDs are connected in the reverse order and they run on negative logic i.e., whenever 1 is given on any pin of the port, the LED will switch off and when logic 0 is provided the LED will glow at full intensity. As soon as we provide supply to the controller, the LEDs start blinking i.e., they become on for a certain time duration and then become off for the same time duration. This delay is provided by calling the delay function. * Description : Source file to use chack pin as output. '* Description : Source file to use chack pin as output. You can download all code and simulate from hear. You have finished reading LED blinking with 8051 and many articles about Tech Gallery in our blog this, please read it. and url link of this article is https://littlebitjohnny.blogspot.com/2012/12/led-blinking-with-8051.html Hopefully discussion articles on provide more knowledge about the world of new tech gadgets.